Hey there! Welcome to thedrumfish.co.uk. 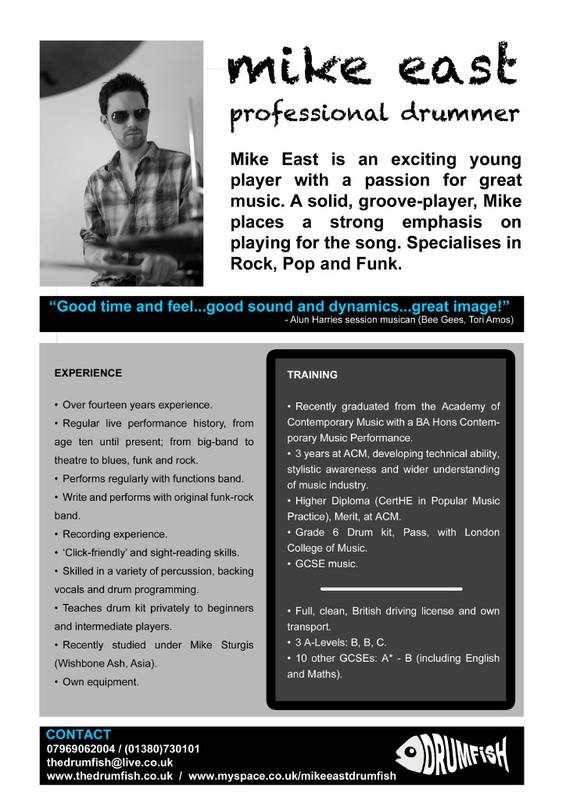 I am Mike East, a freelance drummer and teacher based in Wiltshire. Take a look around the site to find out how to get lessons, to book one of my bands for a gig and check out some of my recordings. 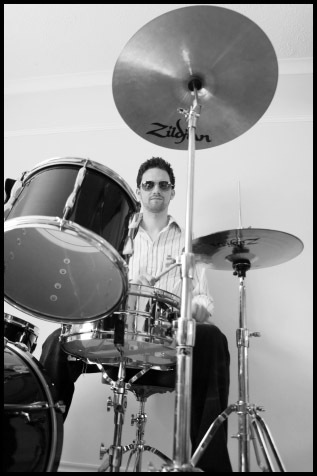 I have been playing and studying drums for over fourteen years now and over the past few years have gained increasing amounts of live and studio experience in a wide array of styles, including rock, funk, blues, soul, pop and folk. I recently graduated from the Academy of Contemporary Music, with a BA (Hons) in Contemporary Popular Music. Check out my ‘Musical CV’ for further details. For more information on me or anything on this site, visit the ‘Contact info’ page or drop me an email at thedrumfish@live.co.uk. 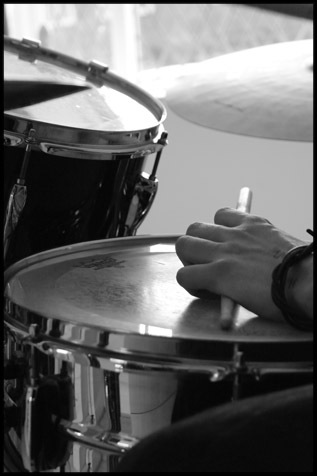 My passion for drumming is equalled by my passion for teaching. 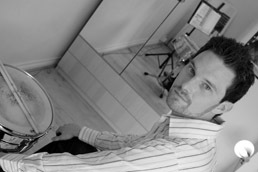 As a teacher I offer professional, tailored drum tuition to all ages, from beginners to intermediate players. Lessons are designed according to the specific interests and ability of the pupil. 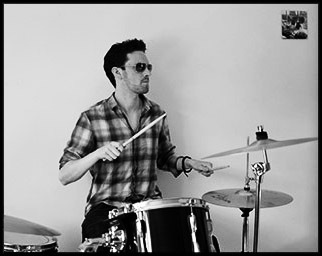 I teach in the Wiltshire area, either from my home in Devizes (where I have an acoustic kit and an electric kit set up side-by-side), a rehearsal room in Trowbridge or at the pupil’s home (this may add additional costs for travel expenses). Lessons are usually 30 minutes or 1 hour in duration, dependent on the needs of the student. I charge £25.00 per hour or £12.50 per half hour lesson. Shared lessons (2 students in one session) are charged at £20.00 per student, per hour. (Prices accurate as of June, 2010 – contact me to check up to date prices). I always endeavour to accommodate the needs of all of my pupils. Any queries big or small, drop me an email at thedrumfish@live.co.uk for more information. Good luck on your musical voyage! “Michael East has a patience that is the best of the best teachers. 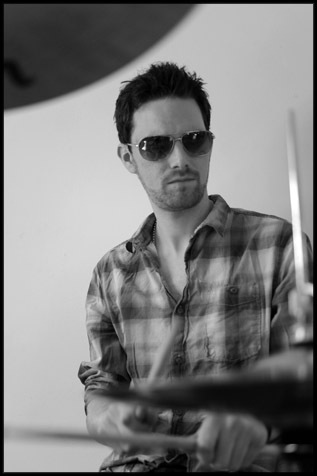 When my son was starting at senior school, Michael became his new drum tutor. Until that point, no other drummer had managed to teach Robbie properly because they were merely instructing him. Michael took time to empathise, he took time to listen to Robbie rather than listening to his drumming, he took time to care and his encouragement was intelligent, perceptive and sincere. At no point did he ever become exasperated or bored; instead he took a genuine interest in the child and as a consequence he gave Robbie such confidence that Robbie became the drummer with the best of his school's many rock bands. I currently play in two Wiltshire-based functions bands: a funk & soul outfit and a rock & blues covers band. If you are interested in booking either of these bands for your event, please contact me at thedrumfish@live.co.uk. 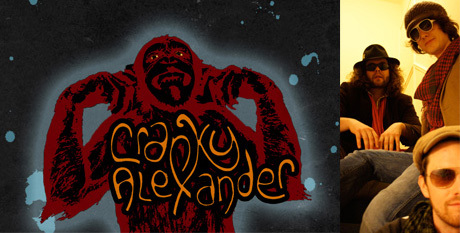 I currently write, record and perform with hard-hitting, funk-rock trio, ‘Cranky Alexander’. At present we are taking our energetic live show to the masses, playing gigs around London and the South West. Find out more at www.myspace.com/crankyalexander. If you'd like to book Cranky Alexander for gigs, parties, bar mitzvahs or other social events, please contact crankyalexander@hotmail.com. I recently recorded and performed drums and backing vocals with ‘The Elliot Coombs Band’, a rootsy, folk-rock outfit from the South West. I am a solid, groove player and place a strong emphasis on playing for the song. I am click-friendly and a confident sight-reader. I am also able to program any drum tracks required for your project. My fees vary depending on the type of project and the location. Check out the tracks below for a flavour of some of my recent recordings and programming. To discuss the details of your project further feel free to drop me an email at thedrumfish@live.co.uk.